Thailand is known as a cheap holiday destination, but is it cheaper to buy a camera when you get to Thailand rather than picking up one before you leave home? Is buying a digital camera cheaper in Thailand than in the UK? The answer is yes and no. Yes, it is definitely cheaper to buy a top of the range digital SLR camera like a Nikon D80 or a Canon E0S 350D in Thailand than it is to buy it in the UK; but no, it’s not really cheaper to buy a point and shoot digital camera like the Canon IXUS 60 in Thailand than it is in the UK – it’s about the same price. If you’re from the USA, you can probably find digital SLRs as cheap in the States as in Thailand – in my experience, the USA has the cheapest camera prices anywhere – even cheaper than buying cameras in Japan. It’s worth checking on Ebay for travel camera bargains (scroll down for the latest Ebay auctions). Here’s some examples – I took this photo of a Canon IXUS 800 IS and Canon IXUS 65 in the window of a Big Camera outlet in Bangkok. These are typical Bangkok prices. (I’ve included rough conversions to British Pounds Sterling below. For the US Dollar amount, you can double the British Pound Sterling number. You might want to use the currency converter for wholly accurate numbers). The IXUS 800 IS is 16,900 Thai Baht, which is around £250. The Canon IXUS 65 is 14,900 Thai Baht, which is around £215. Looking on Amazon.co.uk, you can buy the IXUS 800 IS for £195 – that’s a little cheaper than Thailand. Similarly, on Amazon.co.uk you can buy the IXUS 65 for £165 – that’s a lot cheaper than Thailand. If you live in the USA, it’s definitely cheaper to buy a point and shoot camera at home than in Thailand. On Amazon.com, the Canon IXUS 800 – known in the USA as the SD Powershot 700 – is $US 499. The USA always has extremely good prices for buying digital cameras – they are on a par with buying cameras in Japan, and often cheaper too – so if you are from the States, shop around at home. That said, if you are a tourist in Thailand, you are entitled to a 7 per cent tax rebate when you leave the country. All you have to do is fill in the necessary forms when you buy the camera – you must ensure you buy the camera from a shop that is part of the tax rebate scheme – and then get the documents processed at the airport before you leave to get your cash back. Therefore if you bought a Canon IXUS 800 IS for 16,900 Thai Baht, you would get a 7 per cent rebate, which is around 1180 Baht off the price – or about £17.50. It’s a nice discount but still perhaps not enough to make it worthwhile buying the camera in Thailand, especially as the warranty is usually only for Thailand, and not applicable in international territories. Where there are savings to be made is in buying a digital SLR. I have bought two Nikon SLRs in the last 12 months – the Nikon D70s and the Nikon D40. Nikon has a dedicated SLR factory in Ayutthaya, about an hour’s drive from Bangkok (see this feature about the Nikon factory on DPMac.com) and as such, prices for Nikon items are very competitive in Thailand. Here’s a photo of the Nikon D80 and Nikon D40 side by side that I took recently in The Emporium department store on Sukhumvit 24. On Amazon.com, you can buy the Nikon D80 kit for $US 1220 (3rd party seller) and the Nikon D40 kit for $US 576 (direct from Amazon). That makes the Nikon D40 considerably cheaper to buy from Amazon.com rather than in Thailand. Presumably Amazon.com have bulk purchased the Nikon D40 to offer it at such a low price. For other models, the saving is just a few pounds or dollars, which doesn’t seem that great. However, as mentioned above, you are entitled to a 7 per cent tax rebate when you leave the country as a tourist in Thailand. All you have to do is fill in the tax rebate forms when you buy the camera – you must ensure you buy the camera from a shop that is part of the tax rebate scheme – and then get the documents processed at the airport before you leave to get your cash back. If you’re buying an item like an digital SLR, this 7 per cent rebate is quite significant – it’s an extra £50 ($US 100) off the cost of the Nikon D80 and around £25 ($US 50) off the D40. The other thing that’s important to check is that you get an international warranty with the camera. This is standard practice for Nikon, but you need to double check that the warranty is not Thailand only. 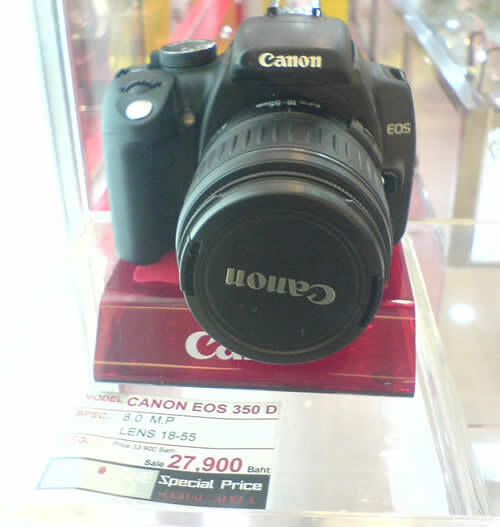 The price in Thailand for the Canon EOS 350 D or Digital Rebel is 28,000 Thai Baht. That’s around £400. On Amazon.co.uk, you can buy the Canon EOS 350 D for £400 (direct from Amazon). Therefore you would only get the 7 per cent tax rebate, which is about £30, as your saving. On Amazon.com, you can buy the Canon Digital Rebel XT with 18 – 55m lens for $595 – much cheaper than buying it in Thailand, even with the rebate. If you want to buy a digital SLR in Bangkok – and not just Nikon – talk to the friendly and helpful staff in FotoFile on the ground floor of MBK shopping mall. The staff speak good English and they can advise you on SLR purchases for all major brands. They also carry a wide variety of lenses. The Fotofile website is kept up to date with their latest prices – in English! – so you can doublecheck before you come to Thailand to see if it’s worth buying in Thailand or at home. Fotofile offer the Tax Rebate scheme, so there’s no problem with that. Be sure to ask that the items you want to buy are covered by the tax rebate scheme before you get into the payment process. I have personally bought two lenses from Fotofile and I’ve had them recommended to me by several people – I foudn them to be very helpful. I would recommend you go early in the morning as it’s a small shop and they are very popular. MBK is one of the biggest shopping malls in Bangkok – the nearest BTS is National Statium. Every taxi driver knows how to get there as well, so it’s not difficult to find. If you have any other tips to add to this buying guide, please leave a comment below. This is a summary of my subjective experiences, and I’m by no means a camera buying pro.